What role does this aging technology play in today's digital world? In some ways, Orwell’s “1984” has perhaps forever warped our perception of CCTV. In the popular novel, Orwell depicts total surveillance with the help of “two-way telescreens”, something from which no one can escape from. Total surveillance in this context means that no one knows if they are being watched, when they are being watched, and what the consequences of this could be. 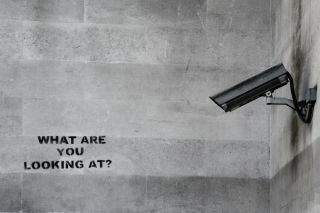 As a result, today – many of us think of “1984” and become paranoid at the thought of being watched all the time. However, in reality, this is not the sole purpose of CCTV, nor is it entirely accurate. So, what is CCTV really like in today’s urban world? To truly understand how CCTV is being used, we must first understand what it is. CCTV stands for Closed Circuit Television, and "Closed Circuit" indicates that the images from CCTV cameras are transmitted to a limited number of receivers. By referring to the "closed line", CCTV broadcasts are distinguished from public television, whose images can be viewed by a vast audience. In modern systems, digital cameras that are connected to a computer via a TCP/IP network (IP cameras) are normally used. Special video surveillance software can be added for other functions such as motion detection, face tracking and data storage. Most surveillance cameras are equipped with either a CMOS or a CCD sensor, each of which depends on light for image generation. Although there are no noticeable differences in video recording with these different sensors nowadays, CCD sensors are predominantly installed in analogue cameras, since they have a PAL resolution. The CMOS sensors are mainly found in HD cameras. Special infrared cameras are required to take pictures in the dark. CCTV is not really a new topic, but the technologies behind it, mainly facial recognition and the detection and analysis of movement patterns are. The first television surveillance system was installed by Siemens in 1942 on the test stand VII in Peenemünde to monitor the launch of the A4 rockets. Professional surveillance systems have been used in modern large cities since the 1970s. Since the turn of the millennium, use and application possibilities have expanded exponentially. In space technology, for example, television surveillance of rocket launches with subsequent recording helps to check the rocket's flight and, in the event of a failure, facilitates the clarification of its causes. Cameras are used on the ground as well as for larger missiles on board. Even the interior of nuclear reactors can be monitored with the aid of television monitoring systems, which is useful given conventional viewing windows are difficult or impossible to use due to radiation and pressure. The area of public surveillance is probably the most common CCTV case because everyone of us might be involved in this on a daily basis. If you live in a modern city, when you close the door of your apartment and step outside, it is possible to walk into a digital surveillance network and become part of something that is stored and analysed centrally. Therefore, as soon as you leave the house, you're public. If you want to know how the digital surveillance network functions, take a look at the EU research project INDECT. Within the framework of INDECT, an attempt was made to detect "abnormal behaviour" preventively by automated evaluation of images from a large number of cameras. The data was linked in real time with other, publicly accessible data from the Internet (such as from social networks). Suspects could then be tracked by fully automated flying camera drones. The project has caused massive criticism from various sources. In addition to conventional filming and photography, the police use mobile surveillance cameras to monitor, and personally identify participants in demonstrations, as well as to document violations of demonstration requirements and laws. Furthermore, an increasing number of state institutions are using video surveillance systems to protect their buildings and premises from attacks such as burglary, theft, vandalism and sabotage, to be able to intervene quickly in the event of possible infringements or to identify the perpetrators retrospectively. Clearly, CCTV, like almost any other digital technology, can be used against its original purpose. However, it is still important to note that CCTV has not been designed to spy on people in their privacy nor is it capable of doing so. Rather, it is about understanding urban life in the 21st century and, if necessary, shaping it in such a way that it is worth living for all. You can see this in China. In the crowded metropoles of the People's Republic, traffic chaos and environmental scenarios are so serious that the introduction of CCTV and environmental monitoring projects has a very broad, public sentiment. CCTV does not breach the barriers of our own four walls, or other rooms where privacy has a protective function (such as the workplace or the doctor's practice). That is why CCTV is not equivalent to future scenarios like in 1984. CCTV, as has been shown, is anything but new. However, the concrete use cases in the focus of safety aspects, environmental monitoring and smart city planning are. And to put it in the words of Elon Musk: It may be advisable to throw a spotlight on new technology trends - as long as it is not a laser. Ultimately, we ought to take the time to familiarise ourselves with the devices that already exist in our own homes. Our own systems require their own safeguards. For example, we’re all too familiar with the fact that every laptop camera and every connected IoT device such as Amazon Alexa and the Amazon Echo can act as a potential gateway to third parties. To prevent a surveillance focused future, we need to build a monitoring solution that possesses all the necessary functions to monitor the entire infrastructure. The barrier to solving these security issues is not technological. We just need to take security seriously and invest in IoT security to solve these problems.